Rome was unreal. We woke up early to go to the Vatican, but sure enough it was closed due to the religious holiday for the entire time we were in Rome. 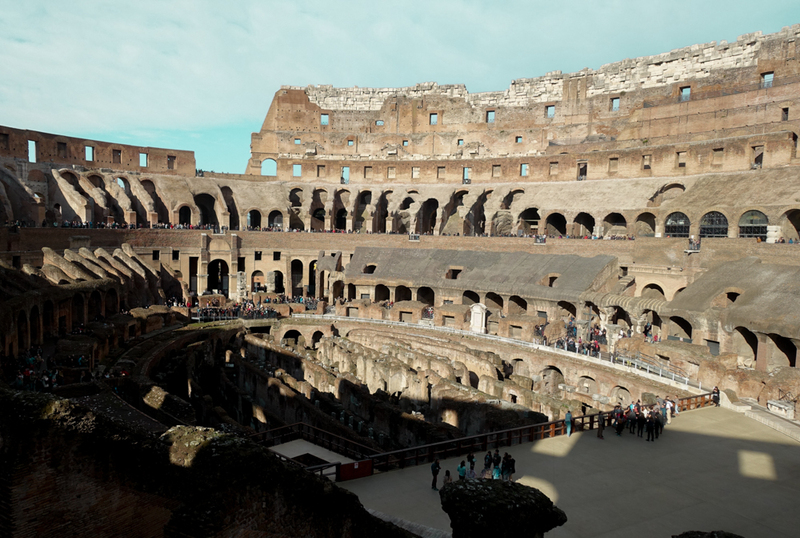 Luckily, The Colosseum was open and we had purchased our tickets online (and finally decided to plan ahead). So we went in and explored. Afterwards we went out and saw the Arch of Titus, the Arch of Constantine, the Roman Forum, and the Palatine Museum. Again, it was amazing and it made me realize how much I appreciate history. All of the ruins took up a lot of time, so we wandered and admired the various street artists in the city. Eventually, we went on our food tour and OH MY GOD, it changed my perspective on food entirely. It was incredible and our tour guide was fantastic, and we had an awesome group of people from all over! All of the food was genuinely Italian, none of that fake, tourist crap. Plus, it was interestingly informative. I say “interestingly” because normally I feel like the information is not needed, but in this case it was fascinating. We learned about how certain products are made, how the government regulates/labels them and (MOST IMPORTANTLY) how to spot the real from the tourist-trap-crap! Hands down, I would do it again... in fact, I would go back to Rome just for this food tour. After that amazing experience (that I could clearly go on and on about), we headed to the Trevi Fountain on the way back to our hostel. It was about 10:00 pm when we got there, which was perfect because there were places to sit and just hang out and enjoy the scene. Plus, the lights were pretty. The Pantheon had been recommended to us multiple times by a variety of people and so we knew we had to go. Especially since we hit all the other obvious tourist spots the day before. So we began our morning by walking there and looked around for about an hour. Afterwards, we spent the next few hours roaming (in Rome lol) and sat in a dog park for awhile. Then, it was back to the train station. o Rome was the only place we planned out and booked tickets and tours and it was worth it 100% so do it. It makes everything a little less stressful. o Looks sketchy, but is genuine and filled with locals. We were the only tourists there and it was delicious. GET PESTO!!! o Seriously, I cannot recommend it enough. If possible, try to have Jess. I’m not sure if there are others who lead it, but she’s been doing this for four years and it shows. She is amazing and she added to the tour, rather than just being a random person who tells you things you already know. o Food you’ll eat (and love): cannoli, wines, cheeses, meats, pizza, pasta, seafood and gelato. Specifically buffalo mozzarella – it is amazing and now I’m addicted.